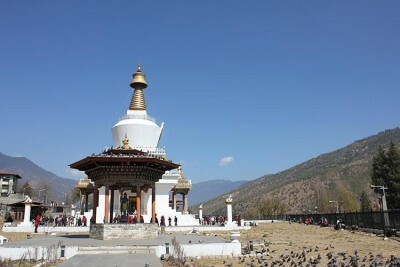 Bhutan has so many imperative points of interest that for most tourists there are abundant things to do and see. 5 nights 6 days Bhutan Tour package makes visiting in all the antique heritages of the major city in a very easy, convenient and comfortable way with fully narrated tours that endow gripping and interesting facts of city and Bhutan’s as well. Our fascinating tour to Bhutan covers an immense canvas of architecture, landscapes and history from Trashichhoedzong to the King Throne Room, from Punakaha Dzong to Wangduephodrang and Tiger Next Monastery to ruin Drukgyel Dzong. The package also justice to some of the world’s handpicked art galleries and the collection like the national museum, library and art school. We accommodate in a cultural tea house and visit tenement families in a village to learn about their culture and way of life. This fascinating Bhutan tour takes you to the oldest Dzong in the Punakha district, which have great historical significance for Bhutanese people. If Buddhism interests you then, Bhutan carries the ocean of knowledge with excess painting and historical sites that portrays the entire journey of Lord Buddha. Furthermore, from bustling city to tranquil mountain, experience the discreet aroma of Bhutan and also explore the Bhutan’s famous sites including fortress, nunneries and shrines. Do not miss to visit Kyichu Lhakhang- the oldest and sacred shrine of the Kingdom, while driving back to Paro from Drukgyel Dozng. Druk Air flight to Paro is one of the most spectacular of all mountain flights. Whether flying along the Himalayan range from Kathmandu or over the foothills, each flight is a mesmerizing feat and offers exciting descent into the Kingdom. On arrival at the airport, received by our representative and then transfer to Thimphu, the modern capital town of Bhutan. Overnight. After breakfast Thimphu sightseeing. Visit Trashichhoedzong, the beautiful medieval fortress/monastery which houses most of the Government’s office and King’s Throne room It is also the summer residence of Je Khenpo, the Chief Abbot. Then visit National Library which has vast collection of ancient Buddhist texts and manuscripts. After lunch visit Handicrafts Emporium which displays wide assortment of beautifully handwoven and crafted products. Then drive to Memorial Chorten, the stupa built in the memory of Bhutan’s Third King who is popularly regarded as Father of modern Bhutan. The paintings and statues inside this monument provide a deep insight into Buddhist philosophy. Overnight at the hotel in Thimphu. After that drive to Wangduephodrang visiting Dzong and local market. The district of Wangduephodrang is also famous for its bamboo products, slate and stone carvings. Overnight at the hotel in Punakha. Afternoon in Paro visit Ta Dzong, the National Museum of the Kingdom. Originally built as Watch Tower since 1967 it is serving as the National Museum of the country and holding fascinating collection of art, artifacts, thangkha paintings and Bhutan’s exquisite postage stamps. Afterwards, walk down a hillside trail to visit Rinpung Dzong. Built in 1646 by Shabdrung Ngawang Namgyal , the first spiritual and temporal ruler of Bhutan, the Dzong houses the monastic body of Paro, the office of the Dzongda (district administrative head) and Thrimpon (judge) of Paro district. Overnight at the hotel in Paro. After breakfast drive north of Paro valley to ruins of Drukgyel Dozng. From this fort Bhutanese repelled several invasions by Tibetan armies. Nearby visit traditional Bhutanese Farm House which offers good insight into lifestyle of local people. While return to Paro town visit en route Kyichu Lhakhang, one of the oldest and most sacred shrines of the Kingdom. Overnight at the hotel in Paro.